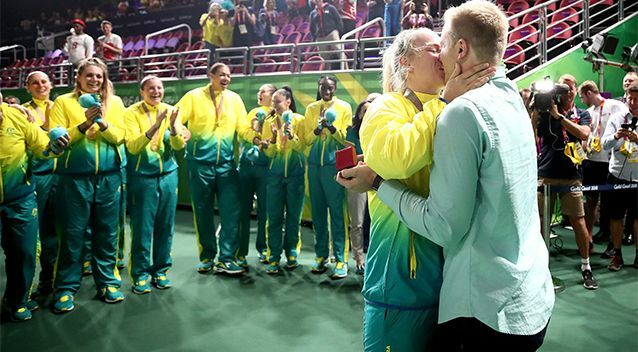 Australian Opals player Nicole Seekhamp had a shock of her life at the 2018 Commonwealth Games in Queensland when her boyfriend [Cody] knelt in front of her teammates to propose to her on Saturday, April 13. The couple who met at the University of South Dakota have been together for two-and-a-half years but the abrupt feeling that oozed out of Seekhamp looked refreshingly new when the two love birds kissed in front of the humongous crowd. “I was not expecting that, so I guess thanks to Cody for stealing the limelight from everyone else,” the 25-year-old told Channel 7. “I had no idea what exactly was happening or when it was happening, he did a very good job so I was shocked,” Seekamp said. “I cried and I don’t really cry that often, so that must have been a good sign,” she added.